This article is about the Algonquian people in Virginia. For the individual, see Powhatan (Native American leader). For other uses, see Powhatan (disambiguation). The Powhatan (/ˌpaʊhəˈtæn, ˈhætən/) people (sometimes Powhatans; also spelled Powatan) are an Indigenous group traditionally from Virginia. In some instances, The Powhatan may refer to one of the leaders of the people. This is most commonly the case in historical writings by the English. The Powhatans have also been known as Virginia Algonquians, as the Powhatan language is an eastern-Algonquian language, also known as Virginia Algonquian. It is estimated that there were about 14,000–21,000 Powhatan people in eastern Virginia, when the English colonized Jamestown in 1607. In the late 16th and early 17th centuries, a mamanatowick (paramount chief) named Wahunsenacawh created a powerful organization by affiliating 30 tributary peoples, whose territory was much of eastern Virginia. They called this area Tsenacommacah ("densely inhabited Land"). Wahunsenacawh came to be known by the English as "The Powhatan (Chief)". Each of the tribes within this organization had its own weroance (leader, commander), but all paid tribute to The Powhatan (Chief). After Wahunsenacawh's death in 1618, hostilities with colonists escalated under the chiefdom of his brother, Opchanacanough, who sought in vain to drive off the encroaching English. His large-scale attacks in 1622 and 1644 met strong reprisals by the English, resulting in the near elimination of the tribe. By 1646, what is called the Powhatan Paramount Chiefdom by modern historians had been decimated. More important than the ongoing conflicts with the English settlements was the high rate of deaths the Powhatan suffered due to new infectious diseases carried to North America by Europeans, such as measles and smallpox. The Native Americans did not have any immunity to these, which had been endemic in Europe and Asia for centuries. The wholesale deaths greatly weakened and hollowed out the Native American societies. By the mid-17th century, the leaders of the colony were desperate for labor to develop the land. Almost half of the English and European immigrants arrived as indentured servants. As settlement continued, the colonists imported growing numbers of enslaved Africans for labor. By 1700, the colonies had about 6,000 black slaves, one-twelfth of the population. It was common for black slaves to escape and join the surrounding Powhatan; some white servants were also noted to have joined the Indians. Africans and whites worked and lived together; some natives also intermarried with them. After Bacon's Rebellion in 1676, the colony enslaved Indians for control. In 1691, the House of Burgesses abolished Indian slavery; however, many Powhatan were held in servitude well into the 18th century. In the 21st century, eight Indian tribes are officially recognized by Virginia, as having ancestral ties to the Powhatan confederation. The Pamunkey and Mattaponi are the only two peoples who have retained reservation lands from the 17th century. The competing cultures of the Powhatan and English settlers were united through unions and marriages of members, the most well known of which was Pocahontas and John Rolfe. Their son Thomas Rolfe was the ancestor of many Virginians; many of the First Families of Virginia have both English and Virginia Algonquian ancestry. Some survivors of the Powhatan confederacy have relocated elsewhere. Beginning in the late 19th century, individual people identifying collectively as the Powhatan Renape Nation settled a tiny subdivision known as Morrisville and Delair, in Pennsauken Township, New Jersey. Their ancestry is mostly from the Rappahannock tribe of Virginia and the related Nanticoke tribe of Delaware. They have been recognized as a tribe by the state of New Jersey. The name "Powhatan" (also transcribed by Strachey as Paqwachowng) is the name of the native village or town of Wahunsenacawh. The title "Chief" or "King" Powhatan, used by the English is believed to have been derived from the name of this site. Although the specific site of his home village is unknown, in modern times the Powhatan Hill neighborhood in the East End portion of the modern-day city of Richmond, Virginia is thought by many to be in the general vicinity of the original village. Tree Hill Farm, which is situated in nearby Henrico County a short distance to the east, is also considered as the possible site. "Powhatan" was also the name used by the natives to refer to the river where the town sat at the head of navigation. The English colonists chose to name it for their own leader, King James I. The English colonists named many features in the early years of the Virginia Colony in honor of the king, as well as for his three children, Elizabeth, Henry, and Charles. Although portions of Virginia's longest river upstream from Columbia were much later named for Queen Anne of Great Britain, in modern times, it is called the James River. It forms at the confluence of the Jackson and Cowpasture rivers near the present-day town of Clifton Forge, flowing east to Hampton Roads. (The Rivanna River, a tributary of the James River, and Fluvanna County, were named in reference to Queen Anne). 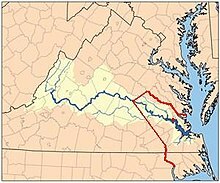 The only water body in Virginia to retain a name related to the Powhatan peoples is Powhatan Creek, located in James City County near Williamsburg. Powhatan County and its county seat at Powhatan, Virginia were honorific names established years later, in locations west of the area populated by the Powhatan peoples. The county was formed in March 1777. Various tribes each held some individual powers locally, and each had a chief known as a weroance (male) or, more rarely, a weroansqua (female), meaning "commander". 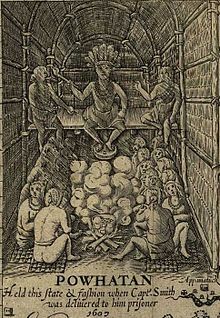 As early as the era of John Smith, the individual tribes of this grouping were clearly recognized by the English as falling under the greater authority of the centralized power led by the chiefdom of Powhatan (c. June 17, 1545 – c. 1618), whose proper name was Wahunsenacawh or (in 17th century English spelling) Wahunsunacock. At the time of the 1607 English Settlement at Jamestown, he ruled primarily from Werowocomoco, which was located on the northern shore of the York River. This site of Werowocomoco was rediscovered in the early 21st century; it was central to the tribes of the confederacy. The improvements discovered at the site during archaeological research have confirmed that Powhatan had a paramount chiefdom over the other tribes in the power hierarchy. Anthropologist Robert L. Carneiro in his The Chiefdom: Precursor of the State. The Transition to Statehood in the New World (1981), deeply explores the political structure of the chiefdom and confederacy. Powhatan (and his several successors) ruled what is called a complex chiefdom, referred to by scholars as the Powhatan Paramount Chiefdom. Research work continues at Werowocomoco and elsewhere that deepens understanding of the Powhatan world. Wahunsenacawh had inherited control over six tribes, but dominated more than thirty by 1607, when the English settlers established their Virginia Colony at Jamestown. The original six tribes under Wahunsenacawh were: the Powhatan (proper), the Arrohateck, the Appamattuck, the Pamunkey, the Mattaponi, and the Chiskiack. He added the Kecoughtan to his fold by 1598. Some other affiliated groups included the Rappahannocks, Moraughtacund, Weyanoak, Paspahegh, Quiyoughcohannock, Warraskoyack, and Nansemond. Another closely related tribe of the same language group was the Chickahominy, but they managed to preserve their autonomy from the Powhatan Paramount Chiefdom. The Accawmacke, located on the Eastern Shore across the Chesapeake Bay, were nominally tributary to the Powhatan Chiefdom, but enjoyed autonomy under their own Paramount Chief or "Emperor", Debedeavon (aka "The Laughing King"). In his Notes on the State of Virginia (1781–82), Thomas Jefferson estimated that the Powhatan Confederacy occupied about 8,000 square miles (20,000 km2) of territory, with a population of about 8,000 people, of whom 2400 were warriors. Later scholars estimated the total population of the paramountcy as 15,000. The Powhatan Confederacy was where the English made their first permanent settlement in North America. Conflicts began immediately between the Powhatan people and the English; the English colonists fired shots as soon as they arrived (due to a bad experience they had with the Spanish prior to their arrival). Within two weeks of the English arrival at Jamestown, deaths had occurred. The settlers had hoped for friendly relations and had planned to trade with the Virginia Indians for food. Captain Christopher Newport led the first English exploration party up the James River in 1607, when he met Parahunt, weroance of the Powhatan proper. The English initially mistook him for the paramount Powhatan (mamanatowick), his father Wahunsenacawh, who ruled the confederacy. On a hunting and trade mission on the Chickahominy River in December 1607, Captain John Smith, later president of the colony, was captured by Opechancanough, the younger brother of Wahunsenacawh. Smith became the first Englishman to meet the paramount chief Powhatan. According to Smith's account, Pocahontas, the Powhatan's daughter, prevented her father from executing Smith. Some researchers have asserted that a mock execution of Smith was a ritual intended to adopt Smith into the tribe, but other modern writers dispute this interpretation. They point out that nothing is known of 17th-century Powhatan adoption ceremonies. They note that an execution ritual is different from known rites of passage. Other historians, such as Helen Rountree, have questioned whether there was any risk of execution. They note that Smith failed to mention it in his 1608 and 1612 accounts, and only added it to his 1624 memoir, after Pocahontas had become famous. In 1608, Captain Newport realized that Powhatan's friendship was crucial to the survival of the small Jamestown colony. In the summer of that year, he tried to "crown" the paramount Chief, with a ceremonial crown, to make him an English "vassal". They also gave Powhatan many European gifts, such as a pitcher, feather mattress, bed frame, and clothes. The coronation went badly because they asked Powhatan to kneel to receive the crown, which he refused to do. As a powerful leader, Powhatan followed two rules: "he who keeps his head higher than others ranks higher," and "he who puts other people in a vulnerable position, without altering his own stance, ranks higher." To finish the "coronation", several English had to lean on Powhatan's shoulders to get him low enough to place the crown on his head, as he was a tall man. Afterwards, the English might have thought that Powhatan had submitted to King James, whereas Powhatan likely thought nothing of the sort. After John Smith became president of the colony, he sent a force under Captain Martin to occupy an island in Nansemond territory and drive the inhabitants away. At the same time, he sent another force with Francis West to build a fort at the James River falls. He purchased the nearby fortified Powhatan village (present site of Richmond, Virginia) from Parahunt for some copper and an English servant named Henry Spelman, who wrote a rare firsthand account of the Powhatan ways of life. Smith then renamed the village "Nonsuch", and tried to get West's men to live in it. Both these attempts at settling beyond Jamestown soon failed, due to Powhatan resistance. Smith left Virginia for England in October 1609, never to return, because of an injury sustained in a gunpowder accident. Soon afterward, the English established a second fort, Fort Algernon, in Kecoughtan territory. In November 1609, Captain John Ratcliffe was invited to Orapakes, Powhatan's new capital. After he had sailed up the Pamunkey River to trade there, a fight broke out between the colonists and the Powhatan. All of the English ashore were killed, including Ratcliffe, who was tortured by the women of the tribe. Those aboard the pinnace escaped and told the tale at Jamestown. During that next year, the tribe attacked and killed many Jamestown residents. The residents fought back, but only killed twenty. However, arrival at Jamestown of a new Governor, Thomas West, 3rd Baron De La Warr, (Lord Delaware) in June 1610 signalled the beginning of the First Anglo-Powhatan War. A brief period of peace came only after the capture of Pocahontas, her baptism, and her marriage to tobacco planter John Rolfe in 1614. Within a few years both Powhatan and Pocahontas were dead. Powhatan died in Virginia, but Pocahontas died while in England. Meanwhile, the English settlers continued to encroach on Powhatan territory. After Wahunsenacawh's death, his younger brother, Opitchapam, briefly became chief, followed by their younger brother Opechancanough. In 1622 (Indian massacre of 1622) and 1644 he attacked the English to force them from Powhatan territories. Both these attempts were met with strong reprisals from the English, ultimately resulting in the near destruction of the tribe. The Second Anglo–Powhatan War that followed the 1644 incident ended in 1646, after Royal Governor of Virginia William Berkeley's forces captured Opechancanough, thought to be between 90 and 100 years old. While a prisoner, Opechancanough was killed, shot in the back by a soldier assigned to guard him. He was succeeded as Weroance by Necotowance, and later by Totopotomoi and by his daughter Cockacoeske. The Treaty of 1646 marked the effective dissolution of the united confederacy, as white colonists were granted an exclusive enclave between the York and Blackwater Rivers. This physically separated the Nansemonds, Weyanokes and Appomattox, who retreated southward, from the other Powhatan tribes then occupying the Middle Peninsula and Northern Neck. While the southern frontier demarcated in 1646 was respected for the remainder of the 17th century, the House of Burgesses lifted the northern one on September 1, 1649. Waves of new immigrants quickly flooded the peninsular region, then known as Chickacoan, and restricted the dwindling tribes to lesser tracts of land that became some of the earliest Indian reservations. In 1665, the House of Burgesses passed stringent laws requiring the Powhatan to accept chiefs appointed by the governor. After the Treaty of Albany in 1684, the Powhatan Confederacy all but vanished. John Smith's map of the Chesapeake Bay and its tributaries (1624 copy). The map details the location of numerous villages within the Powhatan Confederacy. The capital village of "Powhatan" was believed to be in the present-day Powhatan Hill section of the eastern part of Richmond, Virginia, or perhaps nearby in a location which became part of Tree Hill Farm. Another major center of the confederacy about 75 miles (121 km) to the east was called Werowocomoco. It was located near the north bank of the York River in present-day Gloucester County. Werowocomoco was described by the English colonists as only 15 miles (24 km) as the crow flies from Jamestown, but also described as 25 miles (40 km) downstream from present-day West Point, measurements which conflict with each other. In 2003 archaeologists initiated excavations at a site in Gloucester County that have revealed an extensive indigenous settlement from about 1200 (the late Woodland period) through the early Contact period. Work since then has added to their belief that this is the location of Werowocomoco. The site is on a farm bordering on Purtain Bay of the York River, about 12 nautical miles (22 km) from Jamestown. The more than 50 acres (200,000 m2) residential settlement extends up to 1,000 feet (300 m) back from the river. In 2004, researchers excavated two curving ditches of 200 feet (60 m) at the far edge, which were constructed about 1400 CE. In addition to extensive artifacts from hundreds of years of indigenous settlement, researchers have found a variety of trade goods related to the brief interaction of Native Americans and English in the early years of Jamestown. Around 1609, Wahunsenacawh shifted his capital from Werowocomoco to Orapakes, located in a swamp at the head of the Chickahominy River, near the modern-day interchange of Interstate 64 and Interstate 295. Sometime between 1611 and 1614, he moved further north to Matchut, in present-day King William County on the north bank of the Pamunkey River, not far from where his brother Opechancanough ruled one of the member tribes at Youghtanund. The Powhatan lived east of the Fall Line in Tidewater Virginia. They built their houses, called yehakins, by bending saplings and placing woven mats or bark over top of the saplings. They supported themselves primarily by growing crops, especially maize, but they also fished and hunted in the great forest in their area. Villages consisted of a number of related families organized in tribes led by a chief (weroance/werowance or weroansqua if female). They paid tribute to the paramount chief (mamanatowick), Powhatan. According to research by the National Park Service, Powhatan "men were warriors and hunters, while women were gardeners and gatherers. The English described the men, who ran and walked extensively through the woods in pursuit of enemies or game, as tall and lean and possessed of handsome physiques. The women were shorter, and were strong because of the hours they spent tending crops, pounding corn into meal, gathering nuts, and performing other domestic chores. When the men undertook extended hunts, the women went ahead of them to construct hunting camps. The Powhatan domestic economy depended on the labor of both sexes." All of Virginia's natives practiced agriculture. They periodically moved their villages from site to site. Villagers cleared the fields by felling, girdling, or firing trees at the base and then using fire to reduce the slash and stumps. A village became unusable as soil productivity gradually declined and local fish and game were depleted. The inhabitants then moved on. With every change in location, the people used fire to clear new land. They left more cleared land behind. The natives also used fire to maintain extensive areas of open game habitat throughout the East, later called "barrens" by European colonists. The Powhatan also had rich fishing grounds. Bison had migrated to this area by the early 15th century. As of 2014, the state of Virginia has recognized eight Powhatan Indian-descended tribes in Virginia. Collectively, the tribes currently have 3,000-3,500 enrolled tribal members. It is estimated, however, that 3 to 4 times that number are eligible for tribal membership. Two of these tribes, the Mattaponi and Pamunkey, still retain their reservations from the 17th century and are located in King William County, Virginia. Since the 1990s, the Powhatan Indian tribes which have state recognition, along with other Virginia Indian tribes which have state recognition, have been seeking federal recognition. That recognition process has proved difficult as it has been hampered by the lack of official records to verify heritage and by the historical misclassification of family members in the 1930s and 1940s, largely a result of Virginia's state policy of race classification on official documents. After Virginia passed stringent segregation laws in the early 20th century and ultimately the Racial Integrity Act of 1924 which mandated every person who had any African heritage be deemed black, Walter Plecker, the head of Vital Statistics office, directed all state and local registration offices to use only the terms "white" or "colored" to denote race on official documents and thereby eliminated all traceable records of Virginia Indians. All state documents, including birth certificates, death certificates, marriage licenses, tax forms and land deeds, thus bear no record of Virginia Indians. Plecker oversaw the Vital Statistics office in the state for more than 30 years, beginning in the early 20th century, and took a personal interest in eliminating traces of Virginia Indians. Plecker surmised that there were no true Virginia Indians remaining as years of intermarriage has diluted the race. Over his years of service, he conducted a campaign to reclassify all bi-racial and multi-racial individuals as black, believing such persons were fraudulently attempting to claim their race to be Indian or white. The effect of his reclassification has been described by tribal members as "paper genocide". Initially, the Virginia tribes' efforts to gain federal recognition encountered resistance due to federal legislators' concerns over whether gambling would be established on their lands if recognition were granted. Casinos are illegal in Virginia and concerns were expressed about tax effects. In March 2009, five of the state-recognized Powhatan Indian tribes and the other state-recognized Virginia Indian tribe introduced a bill to gain federal recognition through an act of Congress. The bill, "The Thomasina E. Jordan Indian Tribes of Virginia Federal Recognition Act", included a section forbidding the tribes from opening casinos, even if casinos became legal in Virginia. The House Committee on Natural Resources recommended the bill be considered by the US House of Representatives at the end of April, and the House approved the bill on June 3, 2009. The bill was sent to the Senate's Committee on Indian Affairs, who recommended it be heard by the Senate as a whole in October. On December 23, 2009, the bill was placed on the Senate Legislative Calendar under general orders, which is where the bill is currently. The bill had a hold on it placed for "jurisdictional concerns", as Senator Tom Coburn (R-Ok) believes requests for tribal recognition should be processed through the Bureau of Indian Affairs. The Virginia tribes say that the disrupted record keeping under the racially discriminatory practices of Walter Plecker destroyed their ability to demonstrate historical continuity of identity. The bill died in the Senate. In February 2011, the six Virginia tribes started the process again to try to gain federal recognition. They introduced a bill in the US House of Representatives and a companion bill in the Senate on the same day. As of April 2011, the bills are in the Senate Committee on Indian Affairs and the Subcommittee Indian and Alaska Native Affairs, respectively. The tribes of the Powhatan confederacy shared mutually intelligible Algonquian languages. The most common was likely Powhatan. Its use became dormant due to the widespread deaths and social disruption suffered by the peoples. Much of the vocabulary bank is forgotten. Attempts have been made to reconstruct the vocabulary of the language using sources such as word lists provided by Smith and by the 17th-century writer William Strachey. The Powhatan people are featured in the Disney animated film Pocahontas (1995). They also appeared in the straight-to-video sequel Pocahontas II: Journey to a New World (1998). Some of the current members of Powhatan-descended tribes complained about the Disney film. Roy Crazy Horse of the Powhatan Renape Nation said the Disney movie "distorts history beyond recognition". An attempt at a more historically accurate representation was the drama The New World (2005), directed by Terrence Malick, which had actors speaking a reconstructed Powhatan language devised by the linguist Blair Rudes. The Powhatan people generally criticize the film for continuing the myth of a romance between Pocahontas and John Smith. Her English husband was John Rolfe, whom she married on April 5, 1614. The Powhatan tribe have many notable descendants, including Edith Bolling Galt Wilson, Woodrow Wilson's wife; American Western actor Glenn Strange, Las Vegas entertainer Wayne Newton (who is also of Cherokee ancestry) as well as members of the First Families of Virginia, including George Wythe Randolph, Admiral Richard E. Byrd, Virginia Governor Harry F. Byrd, and the professional wrestler and country singer and six time champion of the WWE women's championship Mickie James. ^ "Powhatan". Collins English Dictionary. ^ a b c Waugaman, Sandra F. and Danielle Moretti-Langholtz, Ph.D. We're Still Here: Contemporary Virginia Indians Tell Their Stories. Richmond: Palari Publishing, 2006 (revised edition). ^ a b Wood, Karenne. The Virginia Indian Heritage Trail, 2007. ^ "Matchut". www.virginiaplaces.org. Retrieved November 15, 2018. ^ a b Rountree, Helen C. and E. Randolph Turner III. Before and After Jamestown: Virginia's Powhatans and Their Predecessors. Gainesville: University Press of Florida, 2002. ^ ""The Chesapeake Bay Region and its People in 1607"" (PDF). Retrieved November 15, 2018. ^ Brown, Hutch (Summer 2000). "Wildland Burning by American Indians in Virginia". Fire Management Today. Washington, DC: U.S. Department of Agriculture, Forest Service. 60 (3): 30–33. ^ Kimberlain, Joanne. "We're Still Here", The Virginian-Pilot, June 7–9, 2009. ^ Williams, Allison T. "Virginia tribes may get federal recognition". Retrieved November 15, 2018. ^ James, Moran, (February 25, 2011). "Actions - H.R.783 - 112th Congress (2011-2012): Thomasina E. Jordan Indian Tribes of Virginia Federal Recognition Act of 2011". thomas.loc.gov. Retrieved November 15, 2018. ^ Jim, Webb, (August 2, 2012). "Actions - S.379 - 112th Congress (2011-2012): Indian Tribes of Virginia Federal Recognition Act of 2011". thomas.loc.gov. Retrieved November 15, 2018. ^ "Powhatan People". www.powhatanmuseum.com. Retrieved November 15, 2018. Gleach, Frederic W. (2006) "Pocahontas: An Exercise in Mythmaking and Marketing", In New Perspectives on Native North America: Cultures, Histories, and Representations, ed. by Sergei A. Kan and Pauline Turner Strong, pp. 433–455. Lincoln: University of Nebraska Press. Wikimedia Commons has media related to Powhatan.